Bangkok, Thailand, January 13, 2019 – The excitement for beach volleyball in Asia has reached fever pitch when a total of 29 events including 24 FIVB World Tours will be held in a number of countries across the continent this year. FIVB and AVC have already released the 2019 competition calendar for beach volleyball which saw China receive the green light to host six major events including two FIVB Beach Volleyball World Tour 4-star in Xiamen and Jinjiang and the 2019 Asian Senior Beach Volleyball Championship, of which the host city has yet been revealed. Apart from six beach volleyball events to be held in China, Thailand will host five, with Cambodia reaching a major milestone to organise four events. Vietnam, Malaysia and Korea will host two events apiece, while one each will take place in Australia, Japan, India, the Philippines, Qatar, Singapore, Chinese Taipei and Oman. Last year, the first international beach volleyball competition got off the ground in Cambodia when the Anchor International Beach Volleyball FIVB World Tour 2-star was held in Phnom Penh. The 2019 beach volleyball competitions in Asia will start with the FIVB World Tour 2-star in Phnom Penh, Cambodia from February 21 to 24, followed by the FIVB World Tour one-star in Visakhapatnam, India during February 27 and March 2. Five events will be organised in March. Australia will become a battleground for global beach spikers when the FIVB World Tour 3-star will take place in Sydney from March 6 to 10, with the World Tour one-star Kg Speu in Cambodia simultaneously being held from March 7 to 10. The next event will turn into centre of attention when Doha, Qatar will host the World Tour 4-star between March 12 and 16. 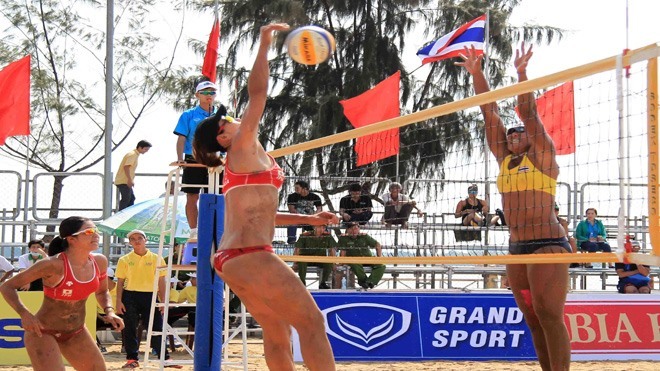 Almost at the same time, Thailand will begin their preparation task for hosting beach volleyball tournaments, starting with the 2019 Asian U21 Beach Volleyball Championships In Roi Et, one of the north-eastern provinces in the country, during March 16 and 18. The last campaign of the month will go back to Cambodia when the country will organise the World Tour 2-star in Siem Reap from March 21 to 24. April, the hottest month of the year, sees determined beach spikers strut their stuff against strong challengers in seven events. The first beach volleyball contest will be held in Cambodia when Battambang will host the World Tour one-star between April 4 and 7 and just one day away, another World Tour one-star will take place in Satun, Thailand. Competitors can sharpen their skills and obtain more competition experience in Malaysia when Langkawi will become the next stop for beach spikers as they will organise the World Tour one-star from April 11 to 14. At the same time, Songkhla, Thailand will perennially host the 20th Samila Asian Beach Volleyball Tour at Samila Beach during April 14 and 16. After that, most of the competitors will fly to Vietnam to take part in the Can Tho Asian Beach Volleyball Tour from April 19 to 23. Strong players from around the world will then return to the sand in Xiamen, China for the FIVB World Star 4-star between April 24 and 28, fighting for money and ranking points, while Thailand will host the last event of the month in the World Tour one-star in Bangkok during April 25 and 28. Those who badly need to make strides in their career cannot miss the World Tour 3-star in Kuala Lumpur from May 1 to 5. The challenging event will be followed by the World Tour one-star at Tuan Chau Island, Vietnam between May 9 and 12. The 2019 Asian Senior Beach Volleyball Championships in China are also due to be held at the similar date. The beach volleyball fever will still grip the Mainland China when the country will host the FIVB World Tour 4-star in Jinjiang during May 22 and 26. The World Tour one-star event will also be held this month in Manila, the Philippines from May 23 to 26, followed by the World Tour 2-star in Nanjing, China during May 30 and June 2. In June, three beach volleyball events will be held in Asia, starting with the World Tour 2-star in Singapore from June 6 to 9 and another World Tour 2-star in Nantong, China between June 13 and 16. A large number of overseas players and their families are expected to arrive in Thailand between June 19 and 23 when Songkhla will host the FIVB Under-21 Beach Volleyball World Championships. Four beach volleyball events will take place in July including two in Korea. The first event of the month will be held in China when Qidong, a county-level city under the administration of the prefecture-level city of Nantong in southeastern Jiangsu province, will host the World Tour 2-star from July 4 to 7. The next stop will be the World Tour one-star in Daegu, Korea during July 11 and 14, followed by another World Tour one-star in Ulsan from July 18 to 21. The last event is expected to attract world-class players to vie for the top honours when Japan will host the FIVB World Tour 4-star in Tokyo between July 24 and 28. The last two beach volleyball events in Asia will occur in August. The Asian Beach Volleyball Tour will take place in Magong City, Penghu Islands in Chinese Taipei during August 7 and 11, with Oman organising the final event in the World Tour 4-star in Salalah from August 21 to 24. With a total of 24 World Tour events and 5 Asian Tour competitions to be contested in Asia this year, it marks a significant milestone for the continent to become a hub for global beach volleyball events. The fun-packed, thrilling sport discipline is also likely to markedly gain in popularity in Asia and can become one of the most-watched sports continentally in the near future.